2.4 What Size Of An Outdoor Heater Do I Need? 2.5 How Many BTU’s or Watts do I Need? 3 How Do Patio Heaters Work? 3.1 What Fuel Should I Use? 5 How Much Does It Cost To Operate A Patio Heater? 6 What Is The Required Clearance Around My Patio Heater? 7 Where Can Patio Heaters Be Used? 7.1 Can I use the patio heater on my enclosed patio? 7.2 Can I use the patio heater on grass, or does it have to be on concrete? 8 Why Buy an Outdoor Patio Heater? There’s no need to end the party early just because of night falls and the temperature drops. Instead, you simply need a great patio heater. 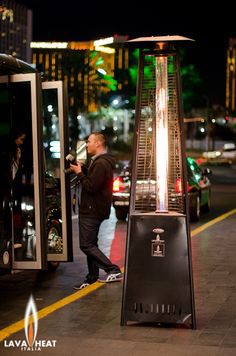 These kinds of heaters are popular choices for bars, restaurants, workplaces, and homes as they allow outdoor spaces to remain heated even if the weather’s undesirable. There are plenty of different patio heaters for you to choose from including floor standing, tabletop, and wall mounted heaters. With such a wide variety of patio heaters to choose from, it’s not surprising that looking for the best patio heaters seems like a daunting task. 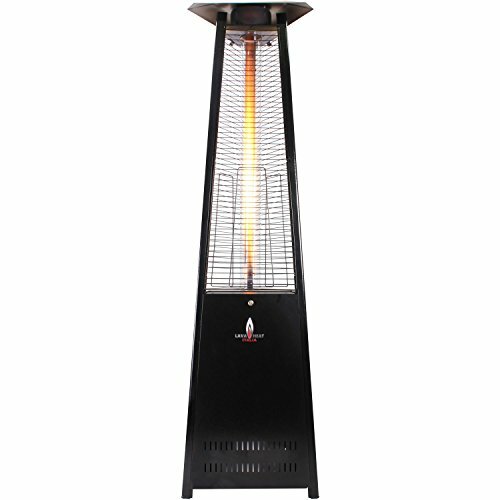 Check out these patio heater reviews to find some of the best outdoor heater models on the market today. If you’re still struggling to make up your mind about which heater you need, you could also refer to our buying guide, where you’ll find all kinds of useful information to help you make the best decision. In order to ensure that it is as difficult as possible to tip this heater over, it comes with a sand filled base. This adds an additional 30lb to the base of the heater so that it is completely safe. The patented reflector dome ensures that you get the full benefit from the 46,000 BTU output that this heater provides. Thanks to the great design of this heater, you can be sure that no power will be lost when it is in operation. To give this heater a stunning and modern appearance, it is finished with a hammered mocha bronze powder coating. 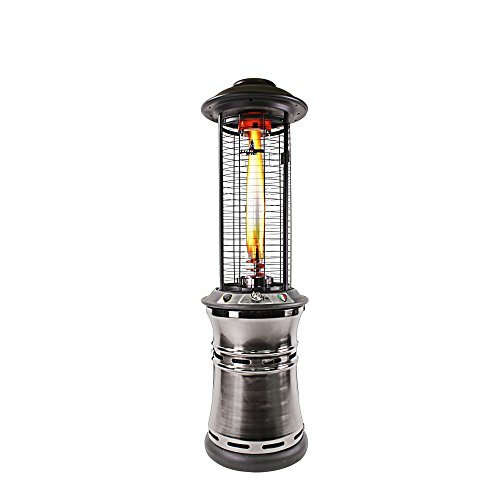 This helps to make this heater a centerpiece in your garden instead of simply being a heater. Even when it is off, it will have an ornamental use on your patio. The wheels that are integrated into the base of this heater make it possible for you to simply wheel it out of the way when you want to free up some room on your patio. 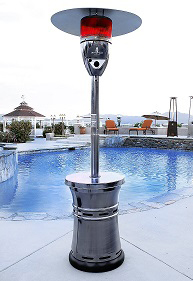 With a quick natural gas hook-up and easy start infrared integrated ignition, it’s no surprise that this is such a popular freestanding patio heater. You can enjoy non-stop use when you connect this heater to your gas supply and it is built to withstand harsh weather and hot temperatures. Safety is one less thing for you to worry about with this heater as it comes with an integrated tilt switch. If it senses that the heater has been tilted or knocked over, it will automatically switch off until it is set upright again. This does mean that you will need to install the heater on a solid and flat surface, but heaters are safer on a level and flat surfaces anyway. The stainless steel enclosure is made of tough 304-grade stainless steel. This provides a heavy-duty finish that is sure to make this product last a lifetime. So that you can move the heater around your patio with ease, it comes with wheels in the base for greater portability. The 58,000 BTU heat output ensures that there is plenty of warmth in your patio and the radius of the heat range is up to 5 foot, which should be plenty of areas to keep your guests warm whilst you socialize. Unlike similar patio heaters, this Golden Flame 46,000 BTU *XL-Series* Matte-Mocha Patio Heater has a pilotless burning system. Whilst many other similarly designed heaters have a pilot flame that burns constantly to make operating the heater as fast as possible, this one does not waste fuel. The other great benefit of having a pilotless burning system is that you don’t need to worry about the flame being blown out by the wind. If you need to rely on a pilot light, you can often find that you’re left without a heater when the flame is blown out. If the weather is particularly windy, you don’t need to worry about the safety of this heater. The base is designed so that is can be filled with sand so that you can add 30lb weight. This ensures that it will not tip over easily. Even with the extra measures to make sure that this heater won’t tip over, it has an inbuilt tilt switch. If the heater senses that it has been knocked over, it will turn itself off automatically. The 46,000 BTU output of this heater ensures that you can enjoy one of the warmest heaters around. The reflector hood takes this heat output and ensures that it is dispersed as widely as possible out into your patio. This powerful and good-looking patio heater is easy to use and convenient. You can add style to your patio and really impress your guests. The 48,000 BTU heat output not only sends out plenty of heat to your patio, but it is also capable of heating an area of up to 175 square feet, or a 15-foot radius. This is a far longer distance than most other freestanding patio heaters that are available and would mean that your guests don’t have to huddle together around the heater to try to stay warm. 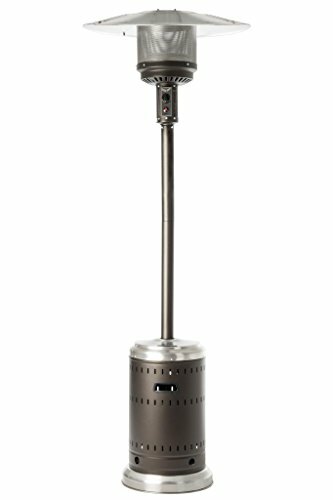 The stainless steel finish makes this heater easy to clean whilst it will stand up to bad weather and high temperatures. The base allows you to store a propane tank if you wish and this will create weight on the base too. As this heater is powered using propane, you can be sure that you can enjoy complete portability. No matter where you want to place it on your patio, you will have no restrictions as long as you choose a flat and level surface. The pilot light will help you to light the heater with ease and if you want to move the heater around, there are integrated wheels in the base. 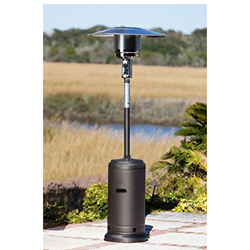 This propane patio heater is a safe and convenient choice for medium sized patio areas. It can offer a powerful heat output that covers up to a 6-foot radius. In addition, the heat source acts as a light for when the night draws in. Thanks to the design of this heater, you can be sure that it will be completely safe for your guests and family to use. A steel grille around the heater prevents anyone from getting too close to the source of the heat and it also stays cool to the touch. You can stay a safe distance back from the flame thanks to this touch. To really enhance the light that this heater produces, a tempered glass tube runs up the length of the heater. This is strong and durable and will withstand high temperatures and harsh weather. Although a little assembly is required when you purchase this heater, it does come with instructions so that you can have it put together as quickly as possible. At just 6 feet tall, this isn’t the tallest heater that you can find out there, but it produces an impressive 36,000 BTU of heat output so that you can enjoy plenty of heat despite it’s smaller size. 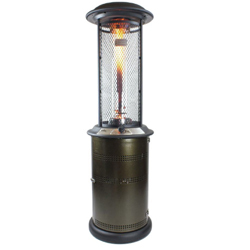 This stylish and impressive looking patio heater is both a durable and useful addition to any patio area. With up to a 5-foot radius of heat all around the heater, you can really make the most of this 56,000 BTU patio heater. A glass tube to the center of the heater is made from borosilicate and is highly weather and heat resistant. It runs the length of this 4ft tall heater so that you can enjoy the best possible heat coverage. 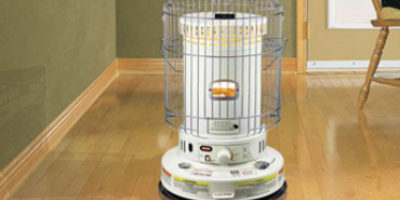 This heater can be positioned anywhere you like, as it is free from a need of electricity. 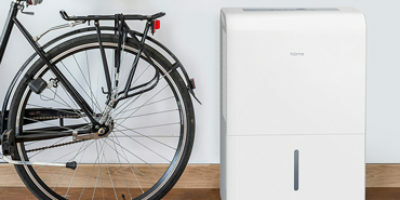 It runs on natural gas, and to allow you to safely connect your gas cylinder to the heater, it comes with a 10-foot long gas connection line. The great thing about this heater is that you can start to use it straight away. You don’t need to worry about needing to assemble it as it comes fully assembled in its box. Simply remove the packaging, connect up your gas and you’re ready to enjoy the warmth. The hammered black coating to the frame of this heater is the perfect design finish for this heater. It is bound to look modern and attractive whilst you entertain your guests on your patio. – A free-standing patio heater is perfect if you want to have heating but not necessarily any tables. They are popular choices in bars and restaurant patio areas. As they are freestanding, they can be set up absolutely anywhere on a patio and they do not need electricity, usually, they use fuel. They have a base, a pole, a heat generator, and a reflector to distribute the heat. The fuel can often be stored in the base. – If you want an outdoor heater that is out of the way and safe, you could choose a wall mounted heater. These are usually electric and use infrared heating methods to keep people warm that are standing nearby. They are mounted high up on the wall and are on brackets so that you can adjust the angle of the heat. – As their name suggests, these heaters are ones that simply stand on your tabletop. If you have a patio table that you and your guests are going to be sitting around, this is a great idea, as you’ll get 360-degree heat from the heater so that everyone is warmed. They tend to have a lower power output than freestanding patio heaters however as they are designed to be closer to the area that they need to warm up. 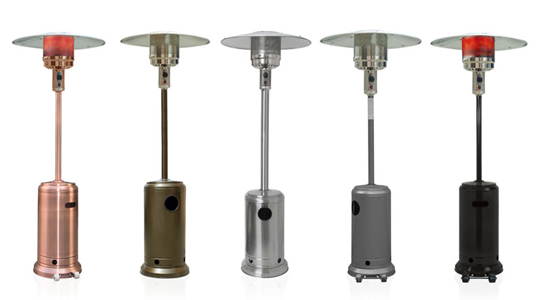 You can find a great variety of patio heaters out there that come in a range of designs, shapes, and sizes. The size of the patio heater often affects the price, however, so if you have a larger budget, you’ll be more likely to afford a larger patio heater. 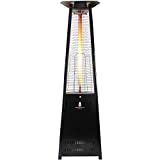 The most common size of a patio heater is the freestanding heater. These tend to offer around 40,000 BTU of heat output. This is necessary for freestanding heaters, as more heat is needed to effectively heat up a larger area around it. Tabletop heaters do not need to be quite so powerful. You will find that most tabletop models offer a heat output of around 12,000 BTU. This is because they only need to heat a nearby area so 12,000 BTU is usually sufficient for this. Wall heaters are the least powerful types of patio heaters and they are also usually the smallest kind too. They have an output of around 3000 BTU, but for outdoor areas in bars and restaurants, there are some more industrial wall heaters that are capable of outputting far more heat than this. You may have seen freestanding patio heaters that have just one dome at the top, whilst other models have 3 domes stacked on top of one another. The single dome heaters are generally far cheaper than the triple dome heater, but they are not as powerful. Triple dome heaters are designed to reflect the heat from the heater in 3 different directions rather than just one. Single dome heaters, on the other hand, can only reflect the heat downwards to an immediate area below the heater. This means that the triple dome heaters have a far larger range in comparison to the single dome heaters and those who want to heat a larger area of their garden prefer them. You will need to have a larger budget for triple dome heaters if this is what you feel that your patio needs. 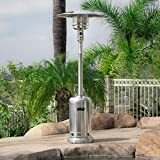 What Size Of An Outdoor Heater Do I Need? When you are purchasing a patio heater, you will need to ensure that you choose the best outdoor heater for your needs. You should measure the patio space and read the product description carefully so that you can be certain that the heater that you choose will be right for your needs. If you are going to be using the patio heater in an area where you already have a large patio table. These are medium-sized heaters that sit on your tabletop. They usually have a medium heat output rating of around 12,000 BTU and will heat a small radius to warm up the area directly around it. The heat is usually given off in a circular direction, so it won’t matter where you position yourself, just so long as you are close enough to the heater. If you don’t have any tables or if you would like the freedom of being able to stand and socialize on the patio with a heater nearby, you should consider a freestanding patio heater. These are available in a variety of styles and sizes, so you should think about the area that you need to heat. Some bars and restaurants have several of these freestanding heaters so that a larger patio area may be heated. If you only have a small patio area, you may be ok with a single dome heater. If you have a larger patio, you should look out for heaters with higher heat output settings and triple domes. This will ensure that a larger area can be heated on your patio. For direct heating, you could purchase a wall mounted heater. These are space-saving options that allow you to safely mount the heater to the wall and direct the heat downwards. You would need to stand in the direct path of the heat stream in order to enjoy the maximum benefits from this kind of heater. How Many BTU’s or Watts do I Need? When you purchase a heater for your patio, you will need to ensure that it will be sufficient for its purpose. If you buy a heater that is inadequate, it will simply be a waste of money, as it will never heat up the area enough. In order to work out how many BTU you need, you will first need to measure the area of the space that you wish to heat. 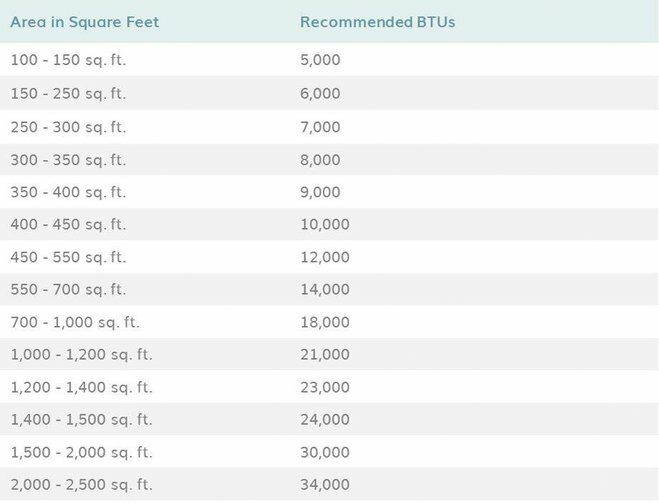 You will need to know how many square feet of patio you will need to heat. You should overestimate this as the BTU given by a manufacturer is usually only under ideal conditions. You can work out the square feet of your patio by multiplying the number of feet long by the number of feet wide. Next, you will need to know how much of a temperature difference you want from the heater. Calculate the difference between the current temperatures in Fahrenheit with the desired temperature in Fahrenheit. The number of watts that you will need to heat up your patio area is a little easier. Simply take the radius in feet of the heat that you wish the heater to produce and multiply this number by 100. As long as you have this high wattage or more, you will have enough power to heat the area that you need to. Again, you should probably choose a heater that offers more watts than is needed to ensure that you will definitely have enough heat. A patio heater is designed to heat up a large area quickly and in order to do this, they need to either burn a fuel such as gas or propane or they heat an element up by converting electricity into heat. The heat that is generated is then emitted out into the surrounding area. Patio heaters use radiant heat rather than fan assisted heat, which is what you’d usually find with indoor heaters. A standard patio heater will heat up the air in all directions. When you purchase the patio heater, it will usually tell you how far the radius of the heat will be, as well as the heat output in either BTU or watts. It is necessary to position the heater in an area where it will provide the most usefulness. There is no point in positioning a freestanding heater near a wall for example if you have room in the center of your patio. Most patio heaters are designed to work outdoors, but if you want to heat an enclosed patio space or a patio that has a roof or awning, you should look out for heaters that are suitable for indoor or outdoor use. Many walls mounted patio heaters are powered using electricity and these are top rated space heaters if you want to keep the air free from harmful gasses. Patio heaters usually use propane, natural gas or electric to generate heat. There are different benefits to using each of these fuel types. – This fuel is easy to use and is ultra mobile. You can purchase tanks of propane in various sizes to suit low usage or high usage and the tanks can be moved around relatively easily. Heaters that are fuelled with propane can be set up anywhere and they require no special installation. Another great benefit of these heaters is that the propane tank can often be concealed in the base of the patio heater. One of the main setbacks about this type of fuel is that it is the most expensive fuel. – These heaters are usually the cheapest to run. Although you can have a constant supply of natural gas, you will need to have the heater plumbed into your existing gas supply and this limits the portability of these heaters. – If you want to have really clean air on your patio, you should choose an electric patio heater. These heaters are efficient and reasonably priced to run, but you will probably need them to be installed by a professional and you won’t be able to move them around easily as they are reliant on having an electric supply. You should always install the patio heater on a flat and level surface with plenty of clearance around it. Make sure that you store any spare fuel for the heater safely. Patio heater fuel can become flammable under certain conditions, so you should keep it away from your home in a cool and dark area. You can sometimes keep fuel tanks at the base of freestanding heaters and this will provide weight to the base for added safety. You should remember to turn the heater off when you are not using it so that you don’t waste energy and so that there is no risk of fire. Even though the heater is outside, there can still be a fire risk with these kinds of heaters. You should choose a heater with a safety tilt switch. This is especially important if you have a floor or table standing patio heater. Never use a patio that is designed for outdoor use indoors. This can be very dangerous. If you want a patio heater that is suitable for an indoor area, you should purchase one that is sold for this specific purpose. If you want a heater that will be completely safe, you should choose an electric wall mounted heater. These heaters can’t be tipped over and they don’t contain any fuels that produce harmful gasses when they burn. Always supervise children around patio heaters. These heaters are very powerful and they can become very hot. Many patio heaters can become hot to the touch, whilst others can become very dangerous if they are tipped over. You should also ensure that pets are kept away from the patio heater especially when it is in use. You should never pace anything on the heater. Do not be tempted to dry clothes, for example, using the heat from the patio heater. Clothing can catch fire easily, especially with the heat of a patio heater. The initial cost that you’ll have to consider is the cost of actually buying the heater in the first place. You’ll find heaters that are available to suit most budgets, but not all of these will be suitable for your needs. You should try to have as realistic a budget as possible, and remember that you really do get what you pay for! The next thing that you will need to pay for is the fuel for your heater. Natural gas heaters use your home’s gas supply, so you don’t need to worry about purchasing any fuel especially and you will only need to pay for what you will use. The same can be said for electric heaters. Propane patio heaters, on the other hand, need you to purchase tanks of propane and depending on how often you use the heater. It is estimated that a 40,000 BTU heater will use around $0.50 an hour in natural gas. In comparison, a 40,000 BTU Propane patio heaters will cost around $1.70 per hour to run. A 4,000-watt electric heater, which is equivalent to the output of a 40,000 BTU heater will cost $1.40 to run. As you can see, it is cheaper to use a natural gas patio heater. What Is The Required Clearance Around My Patio Heater? Patio heaters output a large amount of heat. If you obstruct the heater, or if you stand too close to it, this could be dangerous and could potentially start a fire, or result in toxic gasses in the air to be harmful to people who are too close. You should ensure that you read your instruction manual carefully before you choose a place for your heater to go so that you do not end up obstructing it. You will need to remember to leave clearance at the top of the heater as well as around the sides. If you are using an awning above your heater, you will need to ensure that there is enough space above it for safety. You will need to ensure that you give a heater of 35,000 to 50,000 BTUs around 30 inches of clearance around the top of the heater as well as the reflector and emitter. You should also keep things away from the heater if they are flammable. Smaller patio heaters require around 24 inches of clearance. There should be plenty of heat that is emitted from the heater to allow you to stand a little distance away from the actual heater itself so that you can be as safe as possible whilst the heater is in operation. Where Can Patio Heaters Be Used? Can I use the patio heater on my enclosed patio? You will be able to use a patio heater in an enclosed patio area, however, you should choose the right one for an enclosed space. It is very dangerous to use a natural gas or propane patio heater in an enclosed space, so you should avoid these fuel types for your heater. You can purchase electric patio heaters, which would be more suitable for indoor use. Ultimately, however, you should always check before you buy your patio heater to ensure that it will be safe to use indoors. Not many patio heaters are intended for indoor use, but the ones that are will usually have a much lower BTU or power value than the ones that are to be used in open spaces only. Can I use the patio heater on grass, or does it have to be on concrete? It would not be a good idea to use a patio heater on grass, as the ground is not level. Patio heaters need to be on a flat and solid surface so that they are as safe as possible. If you install your patio heater on grass, it will be more likely to be tipped over. If it’s on grass, the heater may even sense that it is not fully upright and this could activate the anti-tip over safety switch. You should always install your patio heater on a solid and flat surface to ensure that it will perform properly. Why Buy an Outdoor Patio Heater? 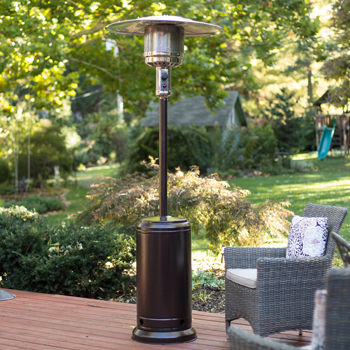 A patio heater is a great idea for anyone who wants to heat an outdoor area. Whether you own a business such as a bar or a restaurant with outdoor socializing space, or if you want to entertain guests on cooler summer evenings at home, you could certainly benefit from a patio heater. These heaters offer a wide choice of power options, so if you don’t have an electrical outlet in your patio area, you will still be able to use a patio heater. Because they are free from electricity requirements, they are also portable so that you can move them out of the way to make more room on your patio when you’re not using the heater or you could simply move the heater out of the way when you are cleaning. As well as offering different fuel options and portability, patio heaters are available in all kinds of different shapes sizes and power outputs. You could mount the heater to a wall for maximum safety, sit a heater on the top of a table for convenience and comfort or you could choose a freestanding heater when you want to add plenty of heat to an open patio space. 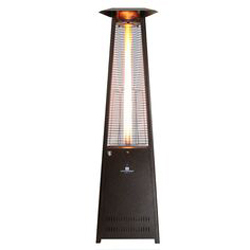 Whatever your needs are, you are sure to find the right patio heater for your requirements. When you need to add some heat to your patio, you’ll find no end of options. As you can tell from these patio heater reviews, there are some great looking freestanding, tabletop and wall mounted heaters to choose from in a variety of styles to suit your tastes. Many people find that safety is a big factor when they are thinking of the kind of heater that would be right for their patio. In our helpful buying guide, we hope that you have found some great tips for choosing the safest and best patio heaters for your home or business. Whether you want to heat a large area, or if you simply want to add heat to a smaller space and save some money, you are sure to find the right heater for you. The best part is that no matter what you choose, most heaters look stunning and will not only add warmth and functionality to your patio, but you can also enjoy a more stylish looking patio too.